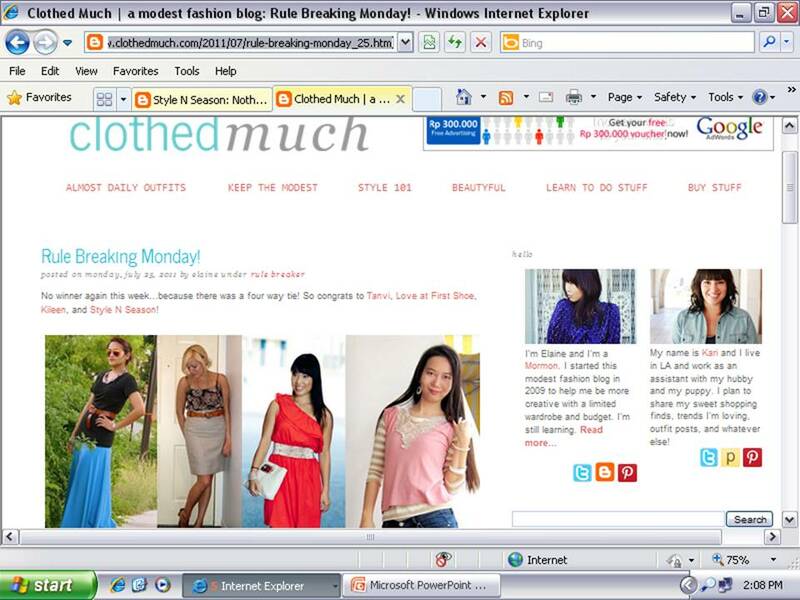 ClothedMuch is the first fashion blog that caught my fancy several years ago. It's a modest fashion blog of an American Born Chinese Mormon girl named Elaine, and you know what, many people don't realize it's a MODEST fashion blog (at first I didn't either) because the style is hip and modern and not... weird... I guess most people identify modesty with Jane Austen's Pride And Prejudice and Laura Ingalls' Little House On The Prairie 18th or 19th century style of looong, flowy dresses only! So you can imagine how surprised I was - in a good way - when I found out that my post titled Rainbow At Jakarta Theater was one of four winners in her July 25, 2011 edition of Rule Breaking Monday. Up to date, the post has had 263 hits, which, for a novice blogger like me, seems an awful lot. Baby steps! Yep, that's me on the right picture. Yayy!!! Did I expect it? Absolutely not. Did I want it? Yes and no. Yes, because maybe I do in the very back of my mind, like I want to be as beautiful as Natalie Portman, as rich as J.K. Rowling, can fly like Supergirl, you know. No, because I don't even think about it on my conciousness. But am I happy about it? Dang rite I am. What if it didn't happen? I'm still happy anyway. Thank you, Elaine, for inspiring so many people out there - myself included - that ordinary people can live fashion in a fun, frugal, stylish, real, creative and modest way. And that you all my dear Readers, for your support, kind words, encouragement, and of course, for reading. I saw that on her blog! I was so excited for you! Congratulations! PS: I'm starting a Feminine Friday link up, I'd love if you and your readers dropped by my blog and participated!